Do you feel pretty aligned with your feminine energy, and not at all with your masculine? Are you very unbalanced (to the point of laziness) and is it costing you business, making you feel inadequate, ineffective, unproductive, leaving you irritated, frustrated and unfulfilled? 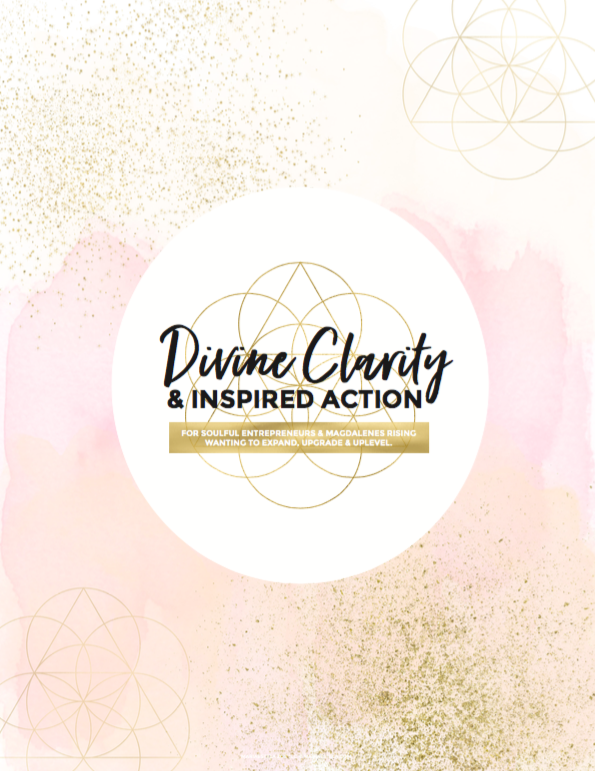 – and it is the result of you not allowing, activating and engaging your Divine Masculine Essence of Doing, Creation, Action and Power to do the work that is his part of the Sacred Marriage. You are so aligned with your Divine Feminine Essence, receive millions of downloads, intuitive knowing and wisdom, but without the outlet your Divine Masculine Essence is there to provide you with, you begin instead spiralling into darkness. At first you may experience it as laziness. Later, as you grow more and more frustrated your Feminine Shadow Aspect rises and frustration turns into bitterness and anger, jealousy and hatriot descending further and further into the darkness. Not taking any action on certain projects. Not writing blogposts, newsletters or articles. Not shooting videos, recording podcasts. Not responding to inquiries regarding your work. Fear of sharing your things on Social Media or with people you meet. Not finishing that program, product or service that’s been tugging your heartstrings forever. – and your business, projects and way of doing things might seem very “masculine” requiring pushing, overpowering, coercion, forcing, cajoling and convincing – all clear signs that your Shadow Aspects are at play. Whenever we deny, suppress or ignore the expression of our Divine Essences, be it Feminine or Masculine, for longer periods of time we veer into their Shadow Aspects. Words, feelings and emotions like pushing, coercion, forcing, cajoling and convincing are hyper-masculine/shadow masculine. They come from a Shadow Masculine, patriarchal, fear based “need to do this and I will destroy everyone and everything in the wake to do it” perspective. Radiant One, if this is you… understand that we are currently living in a patriarchal society which has favoured our masculine aspects for the past 5000 years, aspects that while in their Divine Masculine Essence were immensely important for the evolution of our planet and its souls, but at the end of its cycle have moved into the shadow masculine and have begun creating problems for us, not only on an individual level but globally and so you are not alone in sensing this. We stand on the precipice of a new era and cannot solve our issues with the same consciousness that created them, not within ourselves and not within our global community. You must embody your wholehearted Magdalene nature, connecting mind and heart, body and soul, spirit and matter. I invite you to see the “laziness” and your insights as a gateway calling your attention. You alone hold the key to how and what the embodiment of your divine purpose aka your business looks like to you and working with your Shadow Aspects are highly illuminating for the mere fact that they not only give you a clear sign that something is off and not right in your world, enabling you to allow for healing and do something about it. If you’re frustrated about procrastination, maybe the most loving thing you can do is to pick one thing, sit down and get it done? If you’re skipping deadlines, maybe the projects that you have taken upon yourself does not nourish your soul? If you feel as though you are hiding – how can you show up? Shower yourself with unconditional love. You’ve clearly come to this point because you are ready. All of these frustrations are merely showing you that your box has become too small, your cocoon too restrictive. You are ready to unchain yourself, free yourself, liberate yourself. Acknowledge yourself for having discovered how things are with you. Be compassionate – there’s a reason that it’s been this way, whether you currently know why or not. Forgive yourself, nothing is ever lost or out of sync. Be grateful for what you have and what you are. Surrender and let your Divine Self emerge. The Divine Masculine Essence is one of doing, action and movement, and the best way to activate it is by movement, so in order to engage it, have a danceparty, sing from the top of your lungs, go work out, take your dog for a walk, go for a run, shake your hips, move and then take loving action on something that has been calling your heart forever, today, right this very moment. Share you revelations in the comments below – what’s one key discovery that you’ve made about yourself reading this article? – and, The Divine Masculine Essence love structure and order, action and work. If you would like be supported as you activate and engage your Divine Masculine Essence check out the ways we can work together. The other of the two most common imbalances I call “The Headless Chicken” – you can read all about it here.